Hi guys! Rainy days make for good blogging days. So, alas, our home tour continues upstairs. If you missed Part One, here it is. Part Two is here. I hope you enjoy the tour. Your readership, and feedback are always greatly appreciated. Thank you so much! Photography: Lauren Rubinstein. The Master Bedroom. The antique iron headboard was an anniversary gift from my parents from the antique market in Arezzo, Italy in 1998. 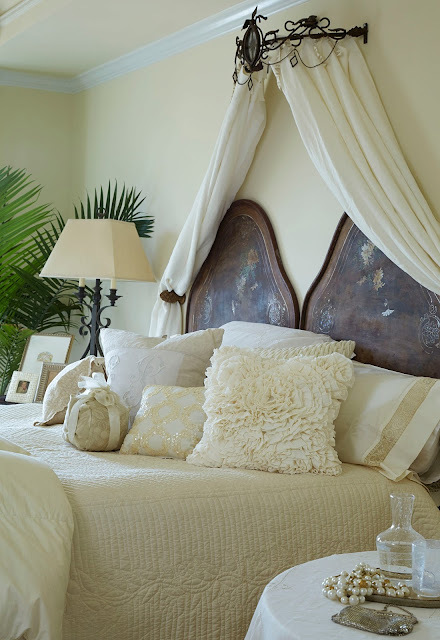 The linens are a mix of antique French, Italian and American, and a few Target throws for texture. The family heirloom Italian dresser was a gift from my mother-in-law. The chair and ottoman came from my parents, as did the needlepoint Aubusson. The walls are BM Winter Wheat. Embroidered draperies from Tuesday Morning. The Guest Room. I covered a garage sale find headboard and window cornice in matlasse, burlap and gauzy drapes. The silk check bedspread and shams belonged to my parents in the early 80's...still a classic! 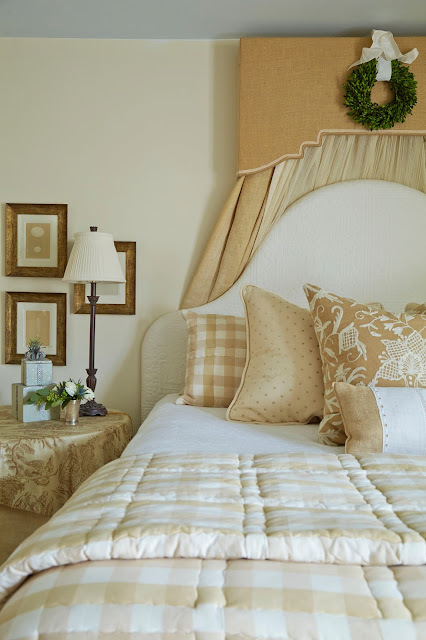 The pillows are a mix of custom with antique linens, crewel, and embroidered dots (also a garage sale find). The walls are BM Navaho White and the ceiling is SW Topsail. Luca's Room. He insisted on red even though I had another plan. The kid has a good eye, and the room turned out alright in the end. What do you think? A pitched silver ceiling with wide horizontal stripes visually increase the size of this tiny room. Every budding fashionista needs a mannequin... and a full length mirror. A glimpse of the garden. Hoping to get out there this week to plant and spiff. Rain rain go away! You know I love your home....that was a fun day at the designer lunch! Thank you so much, ladies, for your continued support! You know it means the WORLD to me. Where did you get the full-length mirror?